Former International Rugby Player Gary Rees is best known as the one club man, playing his whole career with Nottingham Rugby Club. Not only did Gary spend 18 years playing at Nottingham, which equates to over 400 games, he also spent 17 years at the same club, after his playing career ended, as a coach and mentor. 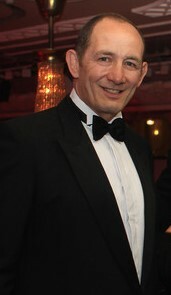 Gary played over 20 games as part of the Midlands Divisional Rugby, including beating the All Blacks at Welford Road in 1983. He also played 18 Barbarian games which included 3 internationals with Australia, All Blacks and Argentina. Internationally, Gary was selected for the Rugby World Cups in 1987 and 1991, and throughout his career he gained 23 England caps. The longest time on the pitch without starting – Wales v Eng 1989 – replacing Mike Teague (who was knocked out) from the kick off. The longest time on the pitch without finishing – Fiji v Eng – Gary was knocked out with 10 seconds to go on the clock. Gary has also been named by Dean Richards as one of the 3 hardest men in rugby!